When I saw this scan of will0301 I just sait "wow!" So I vectored it (so long especially his hair!) 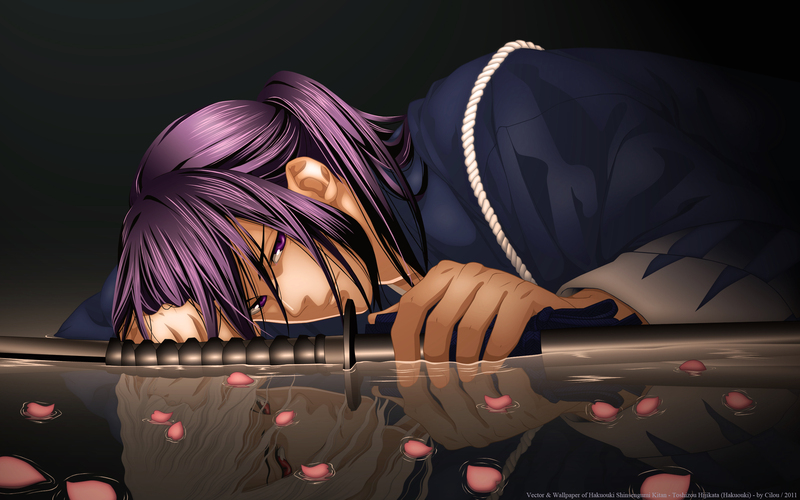 in changing the original reflexion (I made his other face instead of Chikage Kazama). I chose a simple but subtle BG to stand out the character. I tried making something dark and strong in playing with contrast, lightning, saturation and color. I worked during a long time on the atmosphere. Kyaaaah :D Hijikata-sama :3 I love it, it's very pretty, especially the mirror image ;3 I also love the dark colours (I have a thing for dark backgrounds :D). I'm in love))) gorgeous&superb work o the vector, reflections and light! Subarashii *_* I really LOVE your work! Added to favourites! My goodness Cilou, I'm afraid that you've really outdone yourself with this one, it's absolutely stunning. This wallpaper is one of those which I simply can NEVER say no to. his expression... so deep as if i can feel the same feeling..